Accidents are never fun, but they happen. At Gateway’s Auto Body Shop we understand that even the most minor accidents can be stressful. That's why we pride ourselves on ensuring that your car repair process is as seamless as possible. From fender benders to major accidents, we can get you and your vehicle back on the road again in no time. 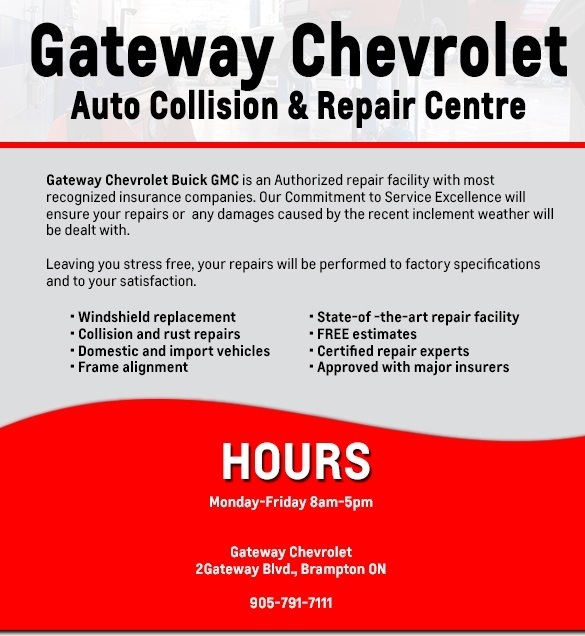 Located in Brampton, Ontario, our repair professionals at Gateway’s Auto Body Shop are here as your trusted consultants. Gateway’s Auto Body Shop is capable of handling any car maintenance or servicing your vehicle may need. Our Gateway Chevrolet Parts Centre warehouses our massive inventory of OEM parts for sale. We also have the means to quickly acquire any specific auto parts for your vehicle so you can get your car repaired and returned to you in a reasonable amount of time. Ignoring service lights, broken parts or faulty systems in your car can be detrimental to it in the long run. Our car mechanics in Brampton can be your solution for all of your routine car maintenance and auto repair needs! Rely on us when you need your next oil change, brake service or paint job. Here in Brampton, we want your trip to the body shop to be convenient and enjoyable. You can stop by or call during our regular business hours for a free estimate of your auto repair cost, or book an appointment online now with one of certified repair experts to get you and your car back on the road!